1. Preheat the oven to 180°C fan/400°F/ Gas 6. Grease a 26cm (10in) springform cake tin (pan), lined with baking paper (parchment paper). 2. Combine the honey, beetroot purée, eggs, olive oil and vanilla seeds in a large bowl and whisk vigorously to mix the eggs well. Add all the dry ingredients and mix well until smooth. 3. Pour the mixture into the springform baking tin. Place the pear slices around the edges of the cake and bake for 50–60 minutes or until the middle has risen but still feels a little gooey. Remove from the oven and allow to cool in the tin. 4. While the cake is in the oven, prepare the poached pears (see below) to serve with the cake. 5. 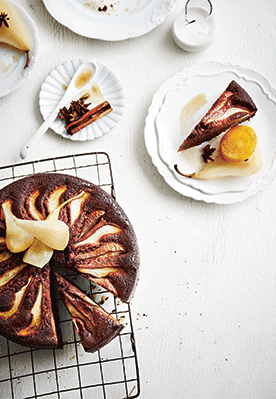 When the cake is ready, remove it from its tin and serve with the poached pear slices. Add a little syrup from the poached pear’s saucepan to the cake slices, if desired. Sprinkle the plate with finely chopped pistachios, poached pears and enjoy! 1. Place the peeled pears, vanilla pod, spices, ginger and orange slices into a large, heavy-based saucepan, then pour in enough filtered water to just cover the pears. 2. Cover the saucepan with a lid and bring to a low simmer. 3. Simmer until the pears are tender. This will depend on how ripe the pears are but generally takes between 30 and 60 minutes.